We often talk about the special touches that keep us coming back to Disney year after year, and the Cast Members often play a big part in that experience. 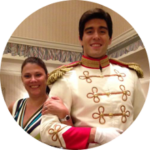 If you’ve ever been to the Grand Floridian Resort, you may have walked right by a Disney legend and not even known it. Of course, we are talking about Richard Gerth. 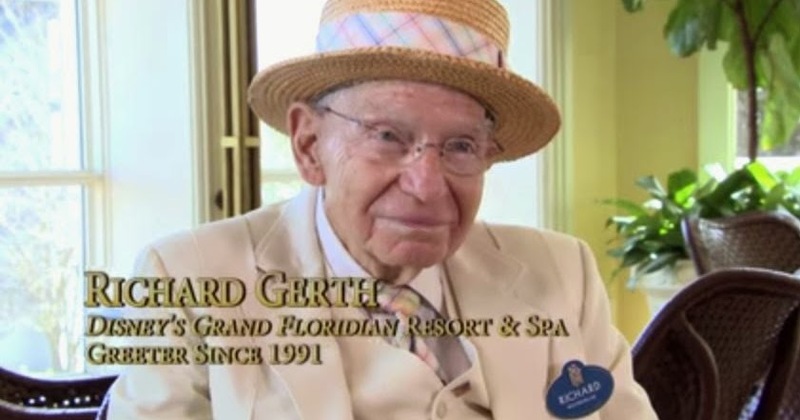 Richard, who is 92-years old and the Official Greeter at the Grand Floridian, has been a Cast Member since 1991. The resort was looking for a greeter, so he walked in one day to apply for the job. He was given a number and told to go to Casting. When he arrived at Casting and gave them the number he was given, he was told he got the job. He never even filled out an application! In addition to being the greeter, Richard is also the Official Fairy Tale Wedding Greeter and has helped over an estimated 3,500 brides on their special day. You’ll often see him in wedding pictures holding the bouquet, escorting the bride, and fixing the train. He has fixed so many wedding dress trains he calls himself a ‘train conductor’. In 2013, Richard received the Walt Disney Legacy Award, an honor he holds near his heart. He loves the constant change of his job, never doing the same thing twice, and believes that ‘life is built on how you act to other people’. So if you are ever at the Grand Floridian, look out for Richard. If he’s not busy helping a bride, he’ll welcome you with a tip of his hat and gladly pose for a selfie! Richard is the epitome of Disney’s magic, loved by each and all. Richard is a very dear man – so kind to young ones, old ones and everyone in between – our trip home is never complete without saying hello to him. We had a wonderful chat with Richard a couple of years ago. What a charmer! Always nice to meet a fellow New Englander….he is full of life and a joy to meet!